CBC News recently gained front-line access to a group of Syrian rebels battling government forces in the city of Aleppo. While they are united in their hatred of Syrian President Bashar al-Assad, some are driven more by religious extremism than a desire to 'free' Syria. It's late at night on our first day in Syria when we get the phone call: Colonel Abdul Jabbar Akaidi is willing to meet us, but we have to come right away. The next day, we are following a group of Syrian rebels to the front. 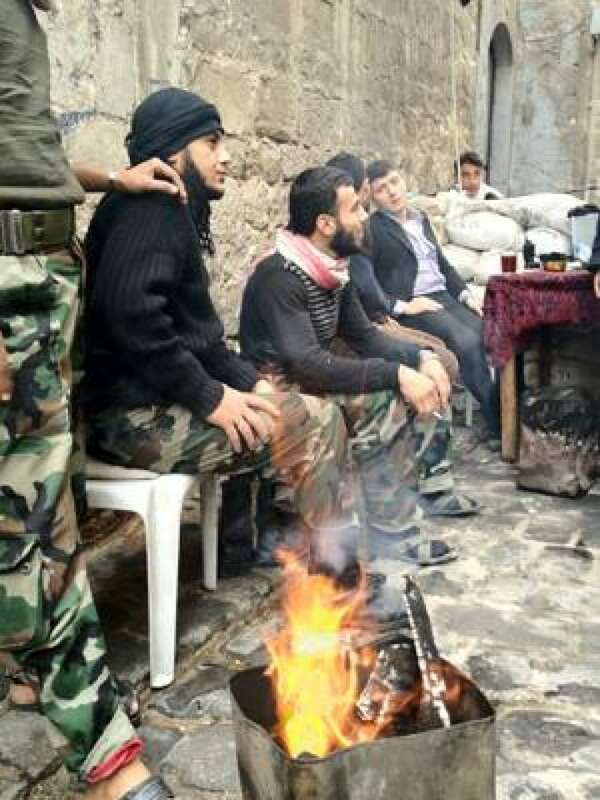 Akaidi is the commander of the makeshift base of operation for the Free Syrian Army (FSA) in the city of Aleppo. 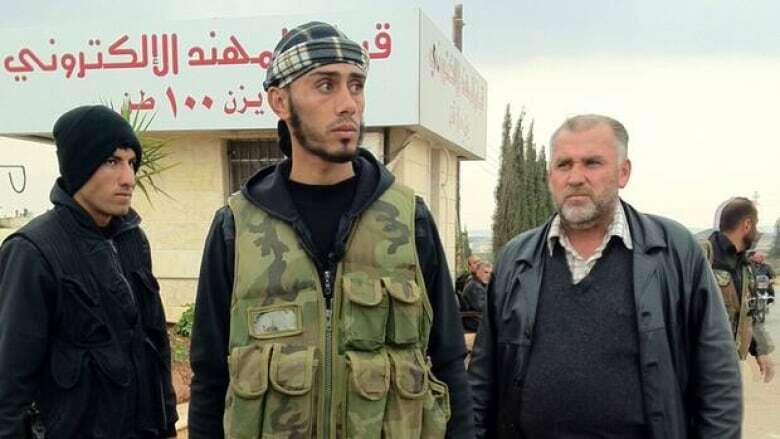 An early defector from Syrian President Bashar al-Assad's forces, Akaidi has just come back from a key victory — the FSA's seizure of Base 46, an important military facility. While the success is a sign of greater strategic planning for Syria's rebel forces, Akaidi has choice words for foreign governments. "We're outraged that the so-called civilized world that claims to defend the oppressed people and always talks of combatting dictatorships looks idly by as Syrian blood is shed," he says. Indeed, while NATO has voted to deploy Patriot missiles on the Turkish border, most foreign governments stop short of fully embracing the FSA. For the most part, they cannot shake their concerns that by supplying weapons to the FSA, they could aggravate a brutal war that has already claimed approximately 40,000 lives, and that these munitions could fall into the wrong hands — namely religious extremists. Taken by the rebels two weeks ago, Base 46 was a nerve centre for Syrian government forces, a 12-square-kilometre garrison supplying the cities of Idlib and Aleppo, which have become two major fronts in the rebels' efforts to topple the regime. Assad's army and support appear weakened, though one should be careful not to predict his demise too quickly. Western powers have increased the pressure on Assad and expressed renewed support for the recently formed coalition of opposition forces. Created in Doha, Qatar, a month ago out of elements from the former Syrian National Council and other opposition groups, the FSA struggles to come up with a formal political structure. It remains a loose alliance, struggling to unite local councils, splinter organizations and divergent opposition groups, as well as secure the loyalties of the various armed units. Ahead of a Friends of Syria meeting set to take place next week in Marrakesh, Morocco, U.S. Secretary of State Hilary Clinton declared, "Now that there is a new opposition formed, we are going to be doing what we can to support that opposition." But western powers are apprehensive about the religious underpinnings of the Free Syrian Army. A charismatic man, Abu Mohammad commands the Kata ib-Essalam, or peace brigades, a large anti-Assad militia operating in the old city of Aleppo. The majority are Sunni Muslims and are self-proclaimed Islamists. A dozen of his men, all very young and neatly dressed in black combat uniforms, sit in silence at his sides as we converse over sweet tea. When probed about the FSA and how it operates, he asks, "Do you want the truth or the storyline?" "The FSA and the coalition is only ink on paper," he says, elaborating that it's more of an image created to present a united front for foreign governments. Abu Mohammad wants to be clear that he takes orders from no one. Sitting next to him is an animated man named Abu Yasser Nejjar. An engineer who used to work in Assad's government, Nejjar explains the virtues of Islam and Shariah law. "We have tried secularism under Bashar al-Assad. That is not what the majority of the people want," he says. Sensing that his audience might doubt that Shariah law provides greater justice and compassion, Nejjar makes a final point. "Today, the secularism you so prize is murdering children in hospitals," he says. Later, at the siege of a military academy in the town of Faveen, young combatants from Kata ib-Essalam are in a cheerful mood. They've killed some government soldiers who were attempting to escape amidst the fighting, and insist on showing us the blood stains that remain next to a half-empty cup of tea on a rooftop, as well as the bloody vest of a government soldier that they kept as a souvenir. They tell us that first and foremost, they fight for Allah and his prophet, Mohammed. Then, they fight for Syria. Abu Muhamdeen, a young father of two from Aleppo, leads the rest of the katiba (or brigade) in chants praising jihad and Allah. He pauses to express admiration for a fierce group of fellow rebels called Jabhat al-Nusra, a sort of elite commando unit of jihadists supported by al-Qaeda. Jabhat al-Nusra is made up of fighters from other Muslim countries, many of them veterans of other conflicts. The group has taken up residence in the very heart of Aleppo, in what used to be a nursing school. The U.S. State Department is reportedly about to add Jabhat al-Nusra to its global list of terrorist organizations. "[Jabhat al-Nusra] are courageous, pious, well trained and they have weapons and money. They are good men," Abu Muhamdeen says. But he quickly adds that he does not share their extreme views. In the bombed-out wasteland that is Aleppo, a semblance of life still goes on. Ordinary citizens have mostly learned to avoid sniper positions, though dozens cross the wrong alleys every day and end up taking a bullet. Still, people spill into the streets and go about their business, hoping the government fighter jets constantly flying above will keep on passing and drop their lethal load somewhere else. Children run around and play to the incessant sound of gunfights. But fear dominates. Citizens fear more attacks, but they also fear expressing themselves. Quietly, away from our camera, many people in the rebel-held part of Aleppo confide that some FSA members have become as much of a terror as Assad's regime. These rebels have become the de facto law, but a law that's as problematic as the many militias. As the conflicts drags on, many who had supported the initial uprising almost two years ago are beginning to have regrets. A delicate man who wishes to be called Mr. Adam says he hopes Bashar al-Assad will soon be a thing of the past, but he knows that "soon" is already too late for his country. Freedom from one dictatorship could very well mean years of tyranny of violence and chaos with no end in sight. It appears to be a very high price indeed for wanting liberty.